Over the years, when Scott and I talked about living overseas, we did it in the same way you’d talk about one day visiting New Zealand: it was fun to dream about, and may not ever happen. I never studied abroad as a student; Scott had studied at Oxford in England for a short time. (I kind of thought that didn’t count as far as living abroad goes—I mean they speak the same language!) Traveling was not a foreign concept; many of my summers were spent with my grandparents while my parents traveled abroad, mainly to Europe. And occasionally, I got to go, too. My first trip to Europe was when I was fifteen. I turned 16 in Paris. I never would have dreamed I’d live there one day. The next time I’d go to Paris I’d be in my 30s, having spent other trips to France visiting the beaches in the south. Scott and I went over for our tenth wedding anniversary in June of 2011. We rented an apartment for the week, instead of staying in a hotel. Our apartment was in the 5th arrondissement, the Latin Quarter, just steps away from where Hemingway used to live with Hadley. We walked everywhere and took the métro to and from dinners out. We ate crêpes on the street and really talked about what it would be like to live in Paris. And so we decided to make it happen. First it started with conversations with other Americans who had done it—packed up, moved schools, and shipped their families overseas. Then we talked to Kate’s school in Charlotte about a good timeline. We were thinking maybe 6 or 7 years in the future. They urged us to move up our date, to travel when the kids were in elementary school. And so the planning began. First, Scott had to figure out a way to work. Over the next two years, he would help to streamline his company and sell off ancillary projects, thus allowing him the flexibility to work from overseas. Then, we all signed up for French lessons. As a family, we studied at École du Samedi, a wonderful school in Charlotte offered on Saturday mornings. We met French natives and also Francophiles who gave us lots of advice. Scott and I also took lessons from Carolina Language Academy under our wonderful teacher, Liz Bertrand. Then, we applied for visas, a huge undertaking that took months, about 400 pages of documents, and a last minute trip to the consulate’s office in Atlanta. Finally, the visas were in hand and the plane tickets bought. Then came: How do you pack for a year?? We rented a furnished apartment which included everything from sheets and towels to salt and pepper. So all we really needed to bring were our clothes and some personal items. Surprisingly, packing the kids was easy. I knew they would outgrow their clothes in a year, so I either packed it or donated it. When we left Charlotte, their closets were empty. As far as toys, they were allowed to bring only what would fit in their roll-on carryon luggage. I couldn’t believe they agreed to this. Packing myself was harder. I had a great group of friends come over one night. First, we cleaned out my fridge and pantry and they took all my perishables. Then, we played dress-up in my closet and made all kinds of mix-and-match outfits to take me through a year in Paris—four seasons, and no real closets. It was challenging to narrow it down, to say the least. 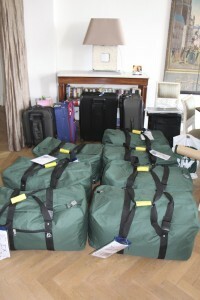 But as we got ready to leave, we each had a carry on suitcase, and we pre-shipped 8 large duffel bags and one box of books. What we packed for a year in Paris. 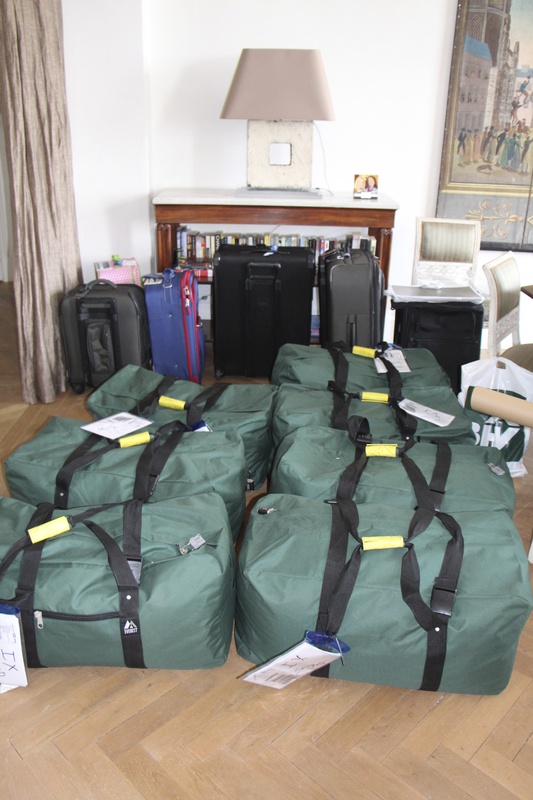 We arrived in Paris and our stuff arrived a few days later. This might be a post for a different time, but people ask, “Do we miss all our stuff that fills a house back in Charlotte.” Short answer: Nope. More on that, later.